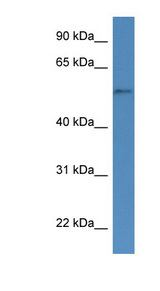 CYP51 antibody LS-C135728 is an unconjugated rabbit polyclonal antibody to CYP51 (CYP51A1) from human, bat, chicken and other species. Validated for WB. Immunizing peptide used to generate LS-C135728. Useful for pre-absorption and neutralization of the antibody's antigen binding site. Western Blot: Suggested dilution at 0.25 ug/ml in 5% skim milk / PBS buffer, and HRP conjugated anti-Rabbit IgG should be diluted in 1: 50,000 - 100,000 as secondary antibody.